As most of you know, I'm a big fan of co-working spaces and am a member of Punspace in Chiang Mai. 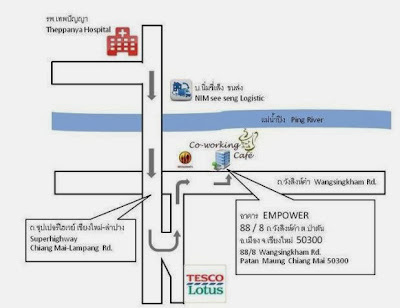 Today I accidentally drove by Co-working cafe here in Chiang Mai and was surprised I've never heard of it. I happened to have my laptop on me so I decided to pop in, check it out and do some work. Location: Near the super highway and the Ping River on the North East Side of the old city, outside of the city towards the big tesco lotus, if you haven't been living in Chiang Mai for a while already, you'll never find this place. There also isn't anything around here. Ambience: On a nice day, the outdoor cafe is perfect. You're sitting by the river, it's quite, peaceful and there is soft music playing. Coffee: Good. Not Nimmanheim coffee shop good like Ninth Street, Impresso or Ristr8to but decent espresso and only 45 baht for a hot americano. Outlets: There are power outlets near every table. Not a ton but enough. Internet Speed: 26ms Ping / 19.78mbps down / 2.04 mbps upload. Streaming Youtube: To me this is the true test of if the internet is usable or not. As long as I can stream a youtube video in 480p without buffering, I'm happy, as it's good enough to Skype and do webwork. Streaming test - Passed. Chair Comfort - Really bad. I first sat on the bar stools facing the river and got off after about a minute but can double as a good height for a standup desk. The wooden chairs provide about 5 minutes of comfort before you slip off. The small indoor room has chairs knee level which I'm not even going to try to sit on. Services and Extras - They have Kayaks and a dart board which is kind of cool, as well as a stationary station and a fax machine. They also have a limited food menu which has non-paleo friendly fried rice and noodle dishes. 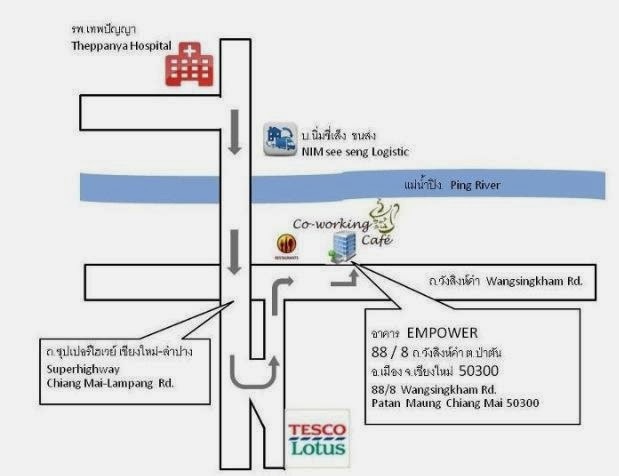 Social Networking: This place is catered towards local thais and is more of a place to check email than to actually get work done or meet other entrepreneurs. 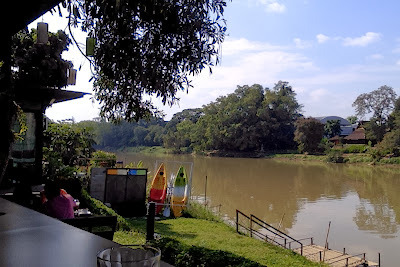 Overall: I'm glad it's around, as it would be a nice place to spend the afternoon near the river, checking email or doing other simple tasks, but it's not comfortable enough to spend more than an hour at. I'll be keeping my membership at Punspace until something amazing comes along, but the nice thing about the just pay for coffee model with Co-working cafe and Coffee Monster is that you can afford to have a membership at Pun and just go to these other places once in a while to change up the scenery, as it really is beautiful. Punspace is still the winner of best overall coworking space in Chiang Mai to get work done for the location, 24/7 access, comfortable chairs, decent internet, great ambience, and it's best aspect, the people you meet there. Coffee Monster is the winner of best non-membership coworking space in Chiang Mai. It has a lot of the good qualities of Punspace but is a just buy something pricing model.